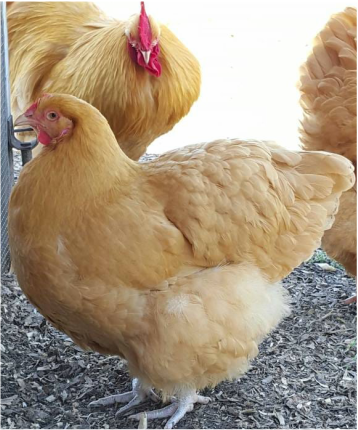 Breed information and history of Buff Orpingtons, includes origin, size, weight, egg size and color, photo's of Buff Orpington hens, rooster, pullet and baby chicks. Watch our featured video about Buff Orpingtons. All the right stuff from Appalachia's Homestead. Don't miss our specials on gifts for chicken lovers. Origin: Great Britain.Sweet natured, hardy, docile, quiet very affectionate, and get along well with other birds. The hen's are hardy and good brooder's and mother's. They are very protective when they are brooding and even more so after their chicks have hatched. The Mother chirps to her young peeps and shows them how to eat and scratch. They follow her around. If your dog or cat happen to wander near her she will attack them. Rooster's are flirtatious and fiercely protective. I have even had one that sit on the eggs while the motherhen took a break away from the nest. Most Buff Orpington's are a gold/yellow color but it is not unusual to find a Black one with opalescent hues of purple and turquoise reflecting in the coloring of their plumage. Temperatures: Can withstand temperatures between 45F-90F. See more photo's of Buff Orpington's below. 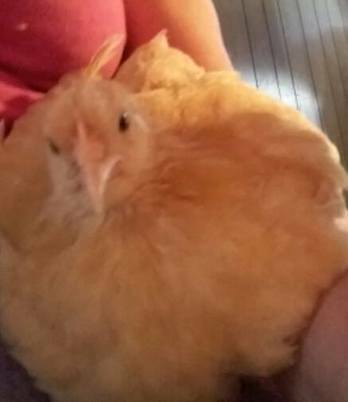 The Buff Orpington was once considered as an endangered species by The Livestock Conservancy. During the 1800's there was much public interest in new chicken breeds, then called "Hen Fever". As this rush of interest died down people were wanting dual purpose American chicken breeds which were being introduced in England. The Buff Orpington was one of these breeds of chickens, wanted for their practical dual purpose qualities, however many of the British preferred white skin and the Orpington's had yellow skin. "William Cook was a humble coachman living in the Kentish town of Orpington, in England, and he had an idea. He began crossing Minorca roosters with Black Plymouth Rock hens, and then the offspring to clean-legged Langshan chickens. His goal was to develop a hardy, fast growing chicken that laid well and yet had the table qualities the British market sought. In 1886 he introduced his creation to the public – it was a success and within 10 years Orpington chickens were well established in England and began to be exported to other countries". William Cook was rewarded financially for his efforts and became quite succesful as he continued his breeding efforts to develop specific body and productive traits in his birds and as a result he created many different varieties of Orpington chickens. Black orpingtons, White orpingtons, Buff Orpingtons, a Speckled Orpington called Jubilee, and the Spangled (Mottled) Orpington. His son in law developed the Blue and Cuckoo orpingtons. Orpingtons arrived in America by 1891 and in 1903 William Cook personally brought a large import of orpingtons to show them in America. The farmers in mid western states really liked the Buff Orpington because of it's beautiful gold color and superior table qualities. The sale of Buff Orpingtons continued to rise until the depression era around 1912. Buff Orpingtons were primarily favored because they grew fast, were excellent egg producers and excellent meat birds weighing in at 2 to 2.5 lbs by the time they reached 8-10 weeks of age and were ready for roasting by 5 months of age. These beautiful birds were even entered into the first egg-laying contest which was held at North Yorkshire farm of Simon Hunter of Northallerton, England in 1887 (Livestock Conservancy, 1). Get the Best Chicken Care Tips! See What Pampered Chickens are Getting!